We are doing a Special Challenge this week at Just Add Ink – to correspond with the Helping Hudson Fundraiser. 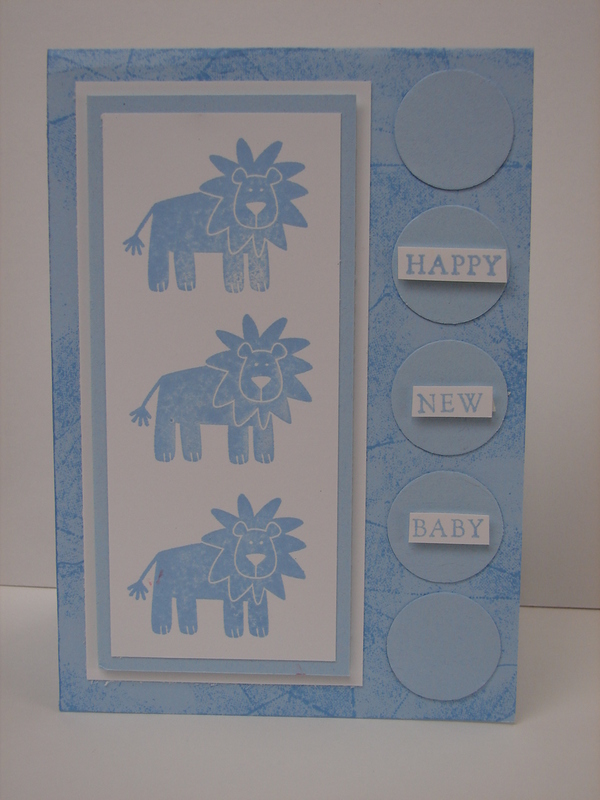 Our challenge is to Just Add Wheels…..so this could be Stamped images, punches or Stampin-Around wheels. Basically if it’s circular it fits the criteria! Here is the card I did for the Challenge. I’ve used the Wild About You and Short and Sweet Stamp Sets. The colours are Brilliant Blue, So Saffron, Real Red, Glorious Green and Whisper White. 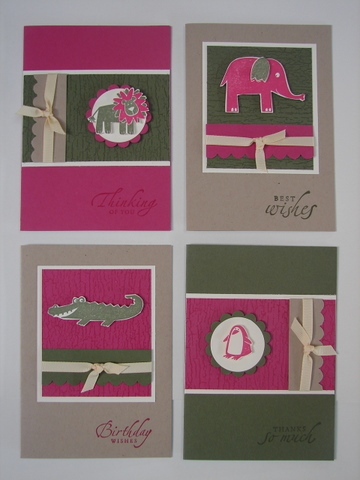 The Just Add Ink Design Team have made some amazing cards and projects for this challenge – so go and check them out here. And have a go at Just Add Wheels yourself too. At the Helping Hudson Website there are heaps of Wheely great Challenges and Tutorials that you can see or try that will also Help Hudson, so have a look there too. It’s Colour Challenge time at Just Add Ink this week – and what great colours they are. Officially it’s my week off Challenges this week – but I love doing the Challenges so much – I just had to have a go. I have put together 4 Cards here they are. So you know what colours I have used. The Stamp Sets are Wild About You, Sincere Salutations & Weathered. Here’s the link to Just Add Ink so you can have a look at all the Challenge entries – and perhaps have a go yourself too. Wow – look at this Sketch – which is the Challenge at Just Add Ink this week. Hmmmm – I pondered on this for quite some time before I made a start on a project. I could not decided what to do – but I did want to have another go at Scrapbooking. So here is what I came up with. I have always loved this Pic of Ana & Sarah – which was taken the day we brought Sarah home from the hospital. Ana was at home because she had busted her knee and could hardly move – but she loved giving her new sister a cuddle. I have used the Wild About You Stamp Set and I have spritz the background with ink. This sketch is such a good one – the Just Add Ink Design Team have created some beautiful projects with it. Here is the link so that you can go and have a look at them. 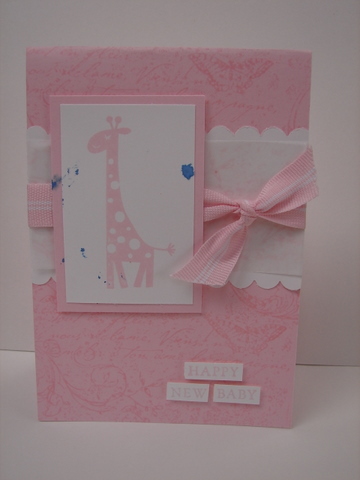 Last night I did a Baby Cards Class. We did one Pink and one Blue. First up the Pink…..
OhhhOooo! – I dropped INK on it! So I had to go with Plan B. But I did show the ladies both options so they could choose which they wanted to do. 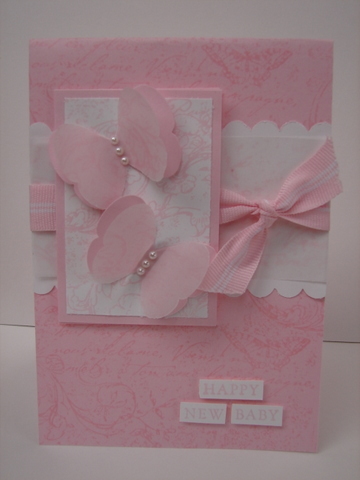 Here I stamped on the Vellum with Pink Pirouette Ink and then punched the Butterflies out. Next up was the Blue Card. 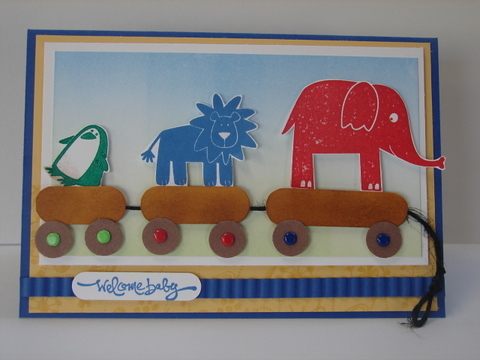 For both of these Cards (the giraffe one) and the Blue one – I have used Wild About You – which was the first SU Set I ever owned.